Coastal municipalities in Lithuania, Poland and Germany are supported by our project experts to find the best installation sites for floating wetlands in order to maximize nutrient removal, gain additional aesthetics benefits to boost tourism and to prevent spatial conflicts of use. Cross-border co-operation along the South Baltic Coast will allow us to test both technological and socio-economical methodologies in different environments. 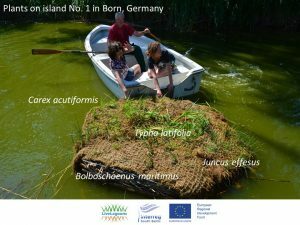 First floating island will be installed in the Curonian lagoon, Darss-Zingst and Szczecin lagoon in 2018 and 2019. Together with our cooperation partner – the Federal State Institute of Agriculture and Fishery MV – we installed the first two small floating islands in the aquaculture research station in Born at the Darss-Zingst Bodden Chain. The two floating wetlands, made out of stainless steel and reed stems, were planted with a variety of native emergent macrophytes. In this first year we want to find out which plants can adapt best to the special site conditions, grow well and remove most efficiently phosphorus and nitrogen from the eutrophicated waters. 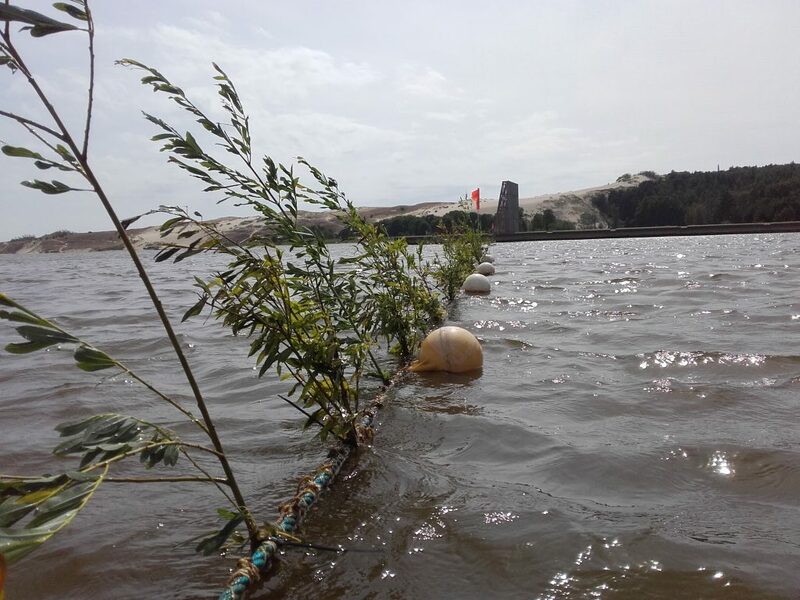 The islands are installed at the outlet of the aquaculture pond (sturgeon cultivation) and we will monitor the water quality as well as nutrient removal in the plant biomass. Another installation of a floating wetland is planned for 2019 at the Szczecin lagoon. The municpality Vogelsang-Warsin is fighting with nutrient pollution and E.coli bacteria. A flaoting macrophyte island will be installed behind their pumping station. Curonian spit national park installed the first active barrier in the Curonian lagoon. It is a net installation located at Nida, Lithuania in a small bay between two piers. It has a length of 200 m and buoys as well as anchoring system were made especially for the project purposes. The net was planted with indigenous plants from the Curonian spit. Local plants were chosen because they might have a highest chance to adapt to the particular environmental conditions of the Curonian lagoon. 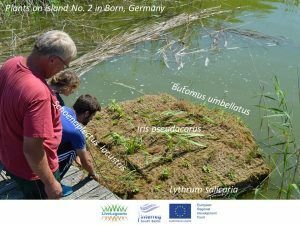 For the first year reed (Phragmites) and willow (Salix) were chosen as native plants and growth as well as nutrient accumulation will be monitored by students and researchers from Klaipėda University. 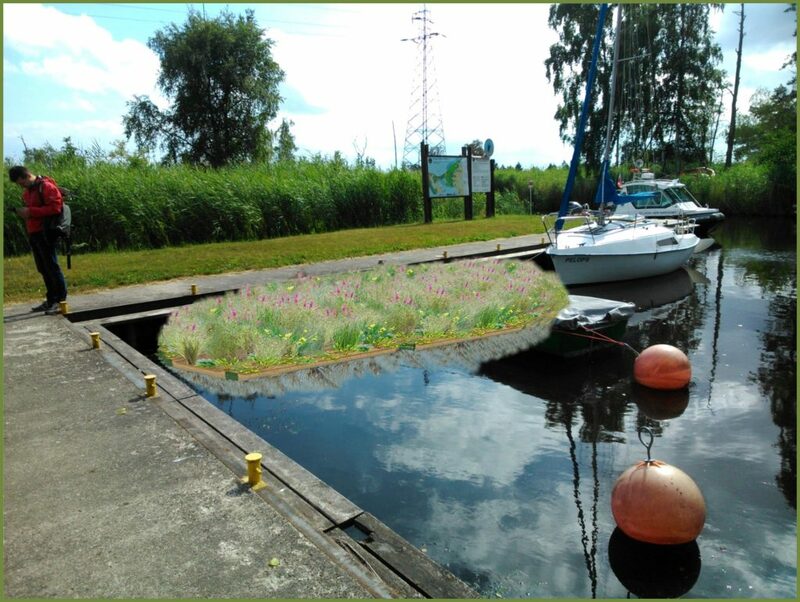 Another floating island with native emergent macrophytes will be installed in Juodkrantė in the upcoming spring. The floating island in Poland will be located in a marina on Wicko Lake in Wolin National Park. It is a shallow and sheltered area where the island can in the water also over winter. The installation is planned for 2019.